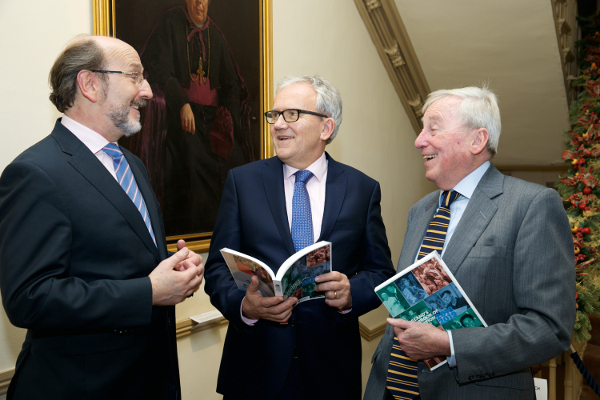 On Wednesday 19th December 2018, Minister for Education and Skills Joe McHugh, TD launched the 12th edition of Education Matters, ‘Ireland’s Yearbook of Education 2018-2019’ in the National University of Ireland on Merrion Square. This issue was edited for the third time by Guidance Counsellor, columnist and broadcaster, Brian Mooney. As part of the event, Minister of State for Higher Education Mary Mitchell O’Connor also led a tribute to the late Professor John Coolahan. Professor Áine Hyland, Emeritus Professor of Education at UCC’s article entitled ‘The Legacy of Professor Coolahan’ in the Yearbook recounts Professor Coolahan’s many great contributions to education in Ireland. Contributors to the Yearbook this year included Professor Mark Rogers, Registrar and Deputy President of UCD who wrote about reform, renewal and funding in higher education, as well as the Government’s Languages Connect strategy. He writes “State investment in higher education brings societal benefits in terms of widening participation, cultural enrichment through creativity and innovation and economic prosperity through productive output”. Dr Cornelia Connolly, Joint Programme Director (Education), Lecturer and Chair of the Research Committee at the School of Education in NUI Galway also contributed to the Yearbook, with an article on computational fluency in higher education. In addition to the Yearbook, www.educationmatters.ie continues to offer blog space to people interested in writing on topics of relevance to those in the education sector. The Education Matters Yearbook can now also be downloaded from the site and a recording of the Launch can be found on the Education Matters Facebook page.